A sign protesting the long tenure of John Heilman on the Weho City Council, and currently as mayor. He was chosen as the City's second Mayor in 1985, and also served as Mayor in 1990, 1995, 1999, 2001 and 2006. 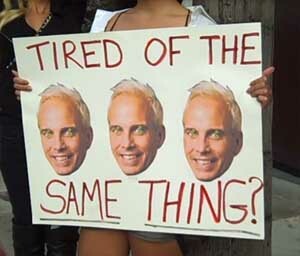 Weho News reports that the 2011 campaign for West Hollywood City Council sharpened in June. Protesters dogging Mayor John Heilman and Council member Abbe Land appeared at public events, including on the city’s Gay Pride Parade’s Red Carpet and a recent campaign fundraiser on the Sunset Strip. A group of protesters led by political activist Mito Aviles, an avowed candidate for council in 2011, staged two recent “silent art attacks” declaiming the hold on power by the aforementioned pair, who have been in office for 25 and 17 years respectively.